Kathleen is a firm believer in ongoing training and education. 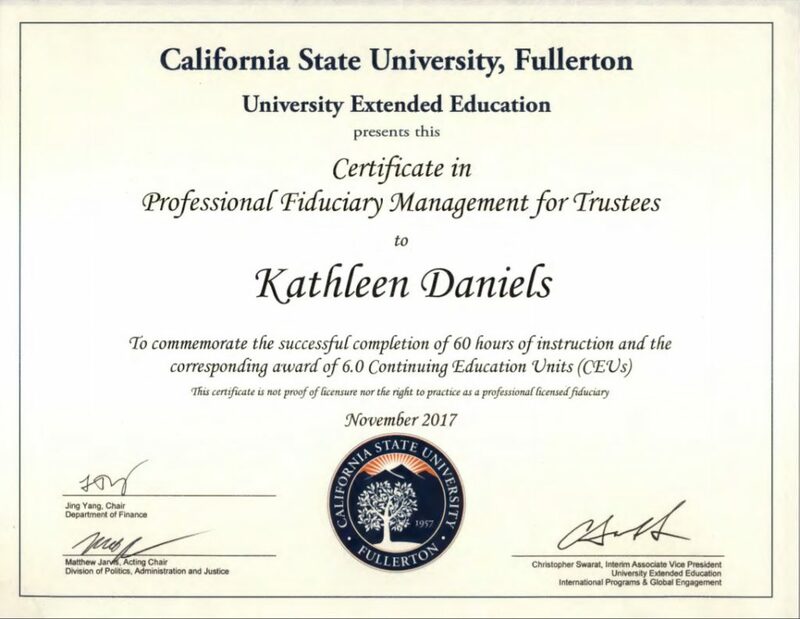 Given her commitment to always improving her skills, she earned a Certificate in Professional Fiduciary Management for Trustees from California State University, Fullerton in November 2017. Probate is a broad term that includes working with successor trustees and conservatorships. They design the fiduciary coursework to develop a comprehensive understanding of the legal and ethical considerations of fiduciary management and standards and practices in the profession. Working with executors and administrators in selling real property as part of the probate estate. Helping successor trustees sell homes owned by the trust. Assisting conservators who need to sell a home. All of Kathleen’s probate clients knew nothing about probate or their duties and responsibilities associated with administering an estate or a trust. Her clients feel overwhelmed with grief from the loss of a loved one. Many feel lost and confused about what to do and when they should or could do it. Kathleen’s role as a real estate professional is to help clients sell homes. She is not a licensed attorney or tax professional. Knowledge is power when it gets used and applied. Expanding her education and training not only allows Kathleen to better serve her clients, but it also differentiates her from the vast sea of real estate agents that don’t possess the education, training, and background that Kathleen brings to the table. The California Fiduciary coursework focuses on the prudent use and protection of a protected person’s assets. This includes record keeping and accounting, managing assets, and the administration or execution of a Will or management of a trust. Getting the certificate allows Kathleen to take the state exam and become a Licensed California Fiduciary for Trustees. With a license, the court could appoint her to become a trustee and manage the protected person’s assets. Kathleen is proud of completing the certification program. She admits she underestimated the amount of classwork involved; the time required to complete the work, take the exams and understand the concepts. She studied her tail off, learned so much more and developed a much deeper understanding of what she already knew. The program requires proof of a Bachelor’s degree from an accredited University or a minimum of 5 years of experience working in geriatric care or fiduciary management. Now that Kathleen’s completed the coursework she knows why they do not allow classes to get taken at the same time. Working full time, managing her business and being a student meant longer hours than usual. Standards and Practices. The focus of this course was on the various positions of trust, duties, legal definitions and liabilities of a practicing fiduciary. Trust Administration and Management. This course covered business practices in managing assets as set forth in the trust. Case studies got reviewed, and they tested us on how we would decide if we were the trustee. We reviewed how the law pertains to the duties of a trustee. Accounting and Record Keeping. This course focused on procedures used to document transactions and protect the fiduciary. They expect fiduciaries to exercise a high standard of care and document prudent protection of the assets they manage. The course covered conflicts of interest and unethical conduct. Management of the Investment Portfolio. This course focused on the legal codes that call for prudence in how a trustee manages and invests the assets of a trust. We covered the Uniform Prudent Investor Act that pertains to portfolio management. We discussed the mechanics of implementing an investment strategy. California law, under the Professional Fiduciaries Act, requires that all professional fiduciaries get licensed. Kathleen meets the requirements to take the state licensing exam. The purpose of completing the certificate program was to broaden and deepen her knowledge. She has no immediate plans to take the State exam and become a licensed California fiduciary for trustees. Kathleen cannot provide legal or tax advice to clients or assume their role as executor, administrator, successor trustee or conservator. However, knowledge of their role, duties, and responsibilities allows her to guide them to the resources that can. Even if Kathleen was a licensed California Fiduciary, she only wears one hat or assumes one role as a real estate broker. That role continues as a probate agent helping administrators, executors, successor trustees, and conservators when they need to sell real property.